Another weekend here already ! I've spent today in my craft room and have had a good catch up on finishing some projects, plus a bit of a tidy up as well ! The sun was shining which helped. Today I'm sharing a baby card, made for a very special new baby girl. 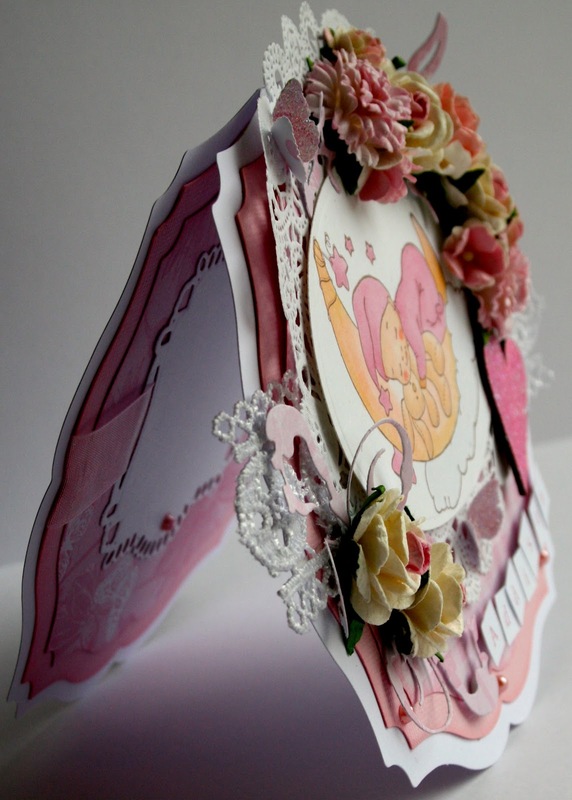 The stamp is a gorgeous Whimsy Stamp 'Cradled by the Moon' and just perfect for a baby card. The Design Paper and lace doily came from my 'stash' and the little chipboard heart has been embossed with WOW Magenta Twinkle Emboss Glitter. The flourish die is also from Whimsy 'Elegant Flourishes'. I've distressed the card with Tim Holtz 'Spun Sugar' and flowers are a mix of 'stash' & Wild Orchids as is the lace. The Tag die is from Magnolia. Hope you like it - send us an email at Crafters Cupboard if you'd like us to order in the Whimsy stamp or dies ! That's all from me for today - hope you are all having a wonderful weekend and maybe getting the chance to get into your craft rooms !